Get 100 percent completion and unlock all endings in Broken of Detroit: Become Human. This walkthrough will provide the steps required to reach 100 percent completion for Broken in Detroit: Become Human. A 100 percent complete rating will take two runs through this chapter since there are two endings to unlock. Both are detailed below so the best one can be chosen. The 100% complete flowchart for Broken. Earning 100% completion on the chapter Broken is simple, as there's only one primary mission path for players to follow that will ultimately branch out toward two different endings. No matter what happens in the first moments of Broken, Markus and Carl will both end up in the studio to confront Leo. Things will escalate, and Carl will instruct Markus not to defend himself. If the Obey Carl option is chosen, the Carl Dies of Heart Attack event triggers and this ending will play out. Obviously, if Carl dies in this chapter he will not appear again in the game. What happens to Markus is the same in both chapter endings. Markus and Carl will end up in the studio with Leo no matter how the first few moments of this chapter play out. However, when Carl tells Markus not to fight back, an opportunity for Markus to become deviant presents itself. If this is chosen and the Push Leo option is taken, Carl will not have a heart attack and will not die. However, Markus will be blamed for Leo, so his ending is the same no matter how players approach this chapter. With Broken at 100 percent completion, continue to The Interrogation. 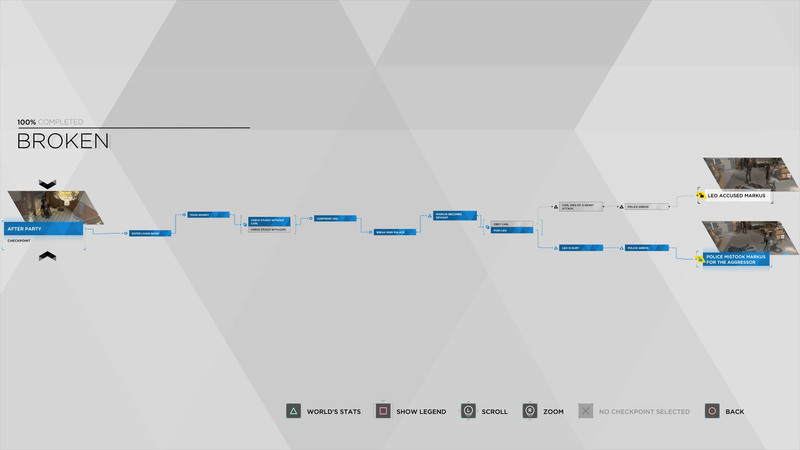 If there’s another part of the game which needs to be addressed, however, be sure to check out our Detroit: Become Human complete walkthrough to learn more about all the chapter endings they affect the evolving narrative.